Members of the Rutherford County Sheriff's Felony Arrest Search Tactical Team plan their response in locating a shooting suspect in Readyville. A suspect accused of shooting his neighbor was charged with attempted murder Tuesday afternoon by a Rutherford County Sheriff's detective, a supervisor said. Suspect Steve Leslie Smith, 42, of Cedar Bucket Road near Readyville, was charged with shooting neighbor Timothy Lonning, 44, of Cedar Bucket Road, said Detective Lt. Todd Sparks. Lonning suffered multiple gunshot wounds. The shooting occurred about 6 a.m. Tuesday in the neighborhood located near the Rutherford and Cannon County line. Lonning was transported to Stones River Hospital in Woodbury then flown by LifeFlight helicopter to Vanderbilt University Medical Center where he is expected to recover. Deputies responding to the scene were unsure of Smith's location. As a safety precaution, deputies evacuated neighbors. 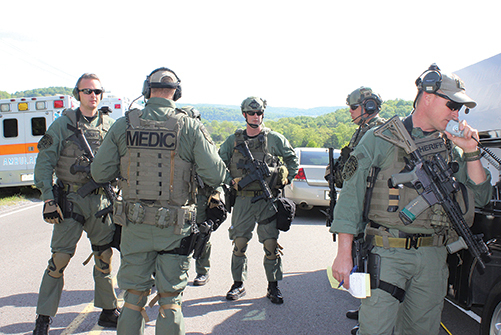 The Felony Arrest Search Tactical Team, the Special Operations Response Team, Emergency Medical Services and Emergency Management Agency responded. Patrol Lt. Rhett Rankin made contact with Smith and convinced him to surrender peacefully. Sheriff Robert Arnold said Lt. Rankin and all the emergency responders did an "outstanding job." "We are glad there was a peaceful ending and everyone is safe," Sheriff Arnold said. Lt. Sparks said detectives interviewed Lonning and other witnesses. "There was a recent history of problems between them," Lt. Sparks said. "We are still trying to determine what happened." Detectives processed the scene, served a search warrant and collected evidence. They are still investigating. Smith was booked into Rutherford County Adult Detention Center where he is being held on a $1 million bond. A hearing is set May 7 in General Sessions Court. Booking records showed Smith was charged with four counts of aggravated assault Jan. 3.